Home » Sol Happenings » 5 Things to Know, from a Super Smeller herself. It can be a blessing and a curse. Those who are "Super Smellers" understand all that surrounds super scent, and why smells are so important! This is why we pick only the purest and best for the shop! I have always had a strong sense of smell. This wonderful if you need to sniff out a gas leak, inhale the lingering smell just before a rain storm, take time to smell the roses, or breath in the soul-warming smell of newborn nuzzled in your arms. Smells trigger cherished memories from days gone by, and I am thankful that I can reminisce over mornings at my grandma’s with the smell of coffee and pancakes, over days begun at Trout Lake Camp with the smell of sizzling bacon. However, being a super sniffer has its downside. I can’t stand the smell of yogurt: all I smell is the scent dirty socks whenever someone pulls out a container of Yoplait or Chobani near me. I’m a bit of a neat freak when it comes to my clothes and the smell of my house (challenging when you have two dogs). When picking my kids up from practice, particularly hockey, the windows of the car had to be rolled down even in the middle of winter. I can tell when someone takes their shoes off, when there is seafood within a 100 yards, when my work out clothes still have an eau de sweat after being washed, and when food goes bad. I am paranoid about having bad breath, my deodorant not working, and taking my shoes off in public. See? Both a blessing and a curse. I can sniff out trouble. Whether its the smell of smoke somewhere in the house or the scent of whatever my dogs were rolling in outside, I always am the first detective on the case because of my sense of smell. When my daughter was in elementary school, she left her backpack in her closet after the last day of school. She didn’t remember the sandwich at the bottom of the bag and over the summer months, I was able to sniff it out. For your sake, I won’t include the details of the disgusting remnants of what was once a sandwich that I found months later. But, I can also sniff out the smell of caramel rolls, chicken being cooked on the grill, and crabapple blossoms in the spring, three scents much more pleasant than a decomposing sandwich. When Gina and I decided to open the store, I went on a quest to find Archipelago products. I had received the Morning Mint hand cream as a gift and loved the way the “Made in the USA” product felt on my hands, but the smell was even better. We have carried Archipelago since we opened the store, and before smelling Archipelago diffusers I didn’t get why anyone would buy a diffuser for their home or office. Now the Havanna and Boticario diffusers are THE signature scent in our store, a.k.a. the reason a lot of our customers say, “It smells so good in here.” I’m not a big fan of perfume, but all of the scent products we have at The Happy Sol have a natural and subtle smell to them that our customers love (and even I can enjoy). We carry USA-made, all-natural Zum products, including laundry soap with essential oils, great hand soaps, lovely room sprays, and counter cleaners. We also have Ambre Blends, another product made right here in the good old U-S-of-A, which has (in my not-so-humble opinion) the best all natural deodorant on the market as well as a fantastic roll-on perfume. If you spend any time with me you will quickly figure out that almost everything I notice begins with how it smells. I comment on smell all day everyday. Good and bad, it’s who I am. 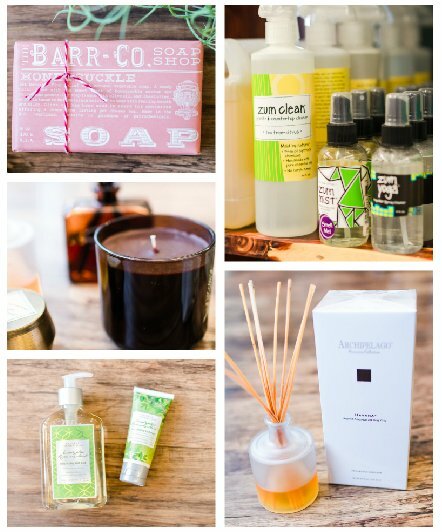 Click Here to See our video about our Store Scents!